Is it a phone or is it a tablet? Samsung’s new GT-N7000 Galaxy Note is a new hybrid type of phone with a screen size which we’ve never seen so far. The phones features 5.3 inch screen size, one of the biggest sized screen seen on any phone till date. Some are even debating whether to call this a phone or a tablet. One thing’s for sure, before buying this, some may think twice if they would be able to carry around this bulky phone in their pockets. This device can create a new category in the market, something in between smartphones and tablets. Like many other Samsung phones, this phone too runs on Android 2.3 (Gingerbread). It seems we’ll still need to wait for the Ice cream sandwich as of now. The 5.3″ display is the largest screen size with great mobility which allows you to see more and do more, while on the go. Because of a big screen, user can now view more and scroll less. Webpages, apps, photos and videos will get an edge and user can now enjoy more with this big screen. Another notable feature of Galaxy Note is that it features World’s first HD Super AMOLED display that provides you high resolution screen for immersive viewing experience. This phone features two camera’s, rear and front. The rear camera is powerful 8MP camera with many different shooting modes and focus mode (single shot, smile shot, panorama, etc). The front camera is 2MP. The S Planner app provides you the tools to manage complicated schedules in an easy way. Thanks to its big screen, viewing and scheduling tasks with the help of calendar can’t be more easier. Various data and ideas can be captured into S Memo and users can edit or share the memo. 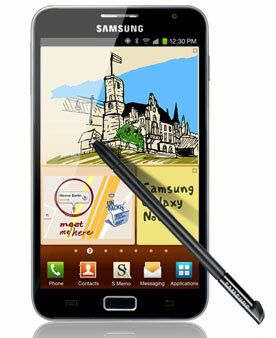 Coming to the touchscreen part, the Galaxy Note not just works by touching but it also features S Pen. The S Pen provides best-in-class mobile input experience. This pen input technology features an array of functions like pressure sensitivity, preciseness, speed and more. With the S Pen, you can easily sketch drawings or write notes with increased accuracy and ease. It’s deeply integrated with the phone’s native applications. Samsung Galaxy Note costs Rs 33,000 in India. This device is also available on Amazon for $734.99 (USD).